ObiJan Technologies: Directv tells me I'm not to be trused! Directv tells me I'm not to be trused! 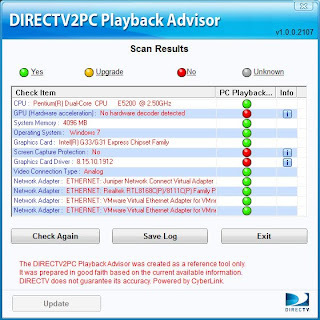 I just discovered "DirecTv2Pc", an application that is supposed to let you display your DVR'd content on your PC. After and exciting download, I ran the installer. Note that the installer doesn't install, it "verifies and assists" the poor hapless user in making sure his systems is blessed enough to receive the holiest of holy, (a.k.a. last nights episode of "dancing with the stars"). Can you guess what the result was? Both my high-end gaming laptop and my shiny new Windows 7 systems where deemed unworthy. But no worries, there was a link to fix the problem! Let's see, I only need to "upgrade" my graphics driver... and graphics card... and monitor. And while I am at it, also the cable and connectors. The "Joe User" in me thinks immediately: Wait a second, this is the exact same machine which smoothly runs Hulu. And Netflix. And DVDs. And games. Oh! And high-def movies rented from iTunes. 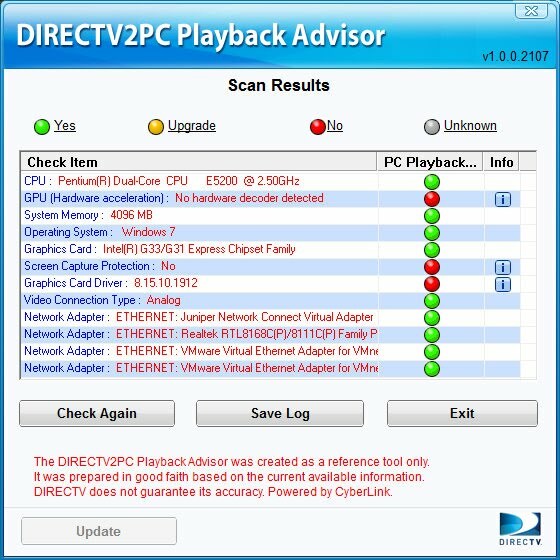 In short, the real reason that Directv wants me to burn several hundreds of dollars on new hardware is not to increase performance for me. It's to add copy-protection (user restrictions) features for them! This is a great example of the fallacy of DRM: I can download and view a pirated copy of any blockbuster movie in a blink, but I can't watch legitimate content that I paid for. Wonder what the moral lesson here is? Oh.... I just noticed that my Directv contract is almost up for renewal... Maybe that dish can be a nice bird bath for the garden?